We recommend not to be tempted by the availability and lower price of 15″ short shaft outboard motors, because such motors don’t fit the W700, and using one would never produce optimal results, even for a highly skilled individual with a lot of experience in boat outfitting. Water cooled motors are quieter but heavier than comparable air cooled motors. The only motor featuring on the above list that’s not water cooled is the Honda 2.3 HP. It is very lightweight, and works very well, but being air cooled makes it considerably noisier. Note: Outboard motor manufacturers recommend flushing the motor’s cooling system with fresh water after every trip in saltwater. It’s possible to flush an outboard with a garden hose outfitted with a special adapter. Nearly all new small motors on the market are 4-Cycle (4-stroke) and not 2-Cycle (2-stroke). The motor runs on regular fuel, and there is no need to mix it with oil. A 4-Cycle motor is cleaner, namely it emits far less stinky fumes than 2-cycle motors do. Some experts argue that for the same displacement of its combustion chamber (cc, volume, size), a 2-Cycle engine in more powerful than 4-Cycle one, but we think that convenience and fresh air are more important. Power – Although some small electric motors are offered as “outboard motors”, just looking at their basic, objective power rating makes us think that they are too weak. Kilowatts to Horsepower conversion: 1 KW = 1.34 HP, and 1 HP = 0.745 KW. Consequently, an electric motor can work well on flat water and at a moderate speed, but not necessarily in adverse conditions, namely strong current, strong wind, etc. Range of travel – A gallon (3.8 liter) of fuel costs a few dollars, and it’s enough for a typical small outboard motor to run for 4 hours at a high RPM, or an entire day at a lower RPM. You can refuel a small outboard’s built-in fuel tank when you’re on board your Wavewalk®. You can take several gallons of fuel with you on a long camping trip, and you can buy more fuel almost everywhere, while recharging an electric motor’s battery can take half a day. Therefore, gas outboard motors offer a reliable and convenient solution whose price / performance ratio is unbeatable by any electric motor available today. All small outboard motors listed above are considered to be Portable. However, between the 29 lbs of the 2.3 HP Honda and the 59 lbs of the 6 HP motors there is a considerable difference, if you need to carry the motor by hand over a distance. Most of the small outboard motors listed here offer to lock their propeller shaft in an intermediary position between the vertical (down) and horizontal (up) positions. In this intermediary, slanted position, the propeller drafts less than in the vertical position, and this allows for driving the boat at a moderate speed in very shallow (‘skinny’) water. Therefore, if you’re looking to fish in skinny water, we recommend that you look for this feature. Most outboard motors on our list feature a gear shift level, and this is a good thing, because the alternative is a centrifugal clutch that lacks an absolute neutral position. The absence of a full neutral gear can make starting the motor a little tricky, if you’re a beginner. Our preference goes to the outboard motors that feature the gear shift lever at the front, rather than on their side. The frontal position makes it easier for the driver to access the lever whether the motors points left or right, and even if the driver is facing forward. All the above listed outboard motors come with a built-in (integrated) fuel tank, and this is a convenient feature considering the alternative is to have a fuel line run from a separate tank to the engine. When you operate such a small craft as a Wavewalk, simplicity becomes increasingly important. The propellers that come standard with these outboard motors fit Wavewalk’s kayaks and portable skiffs. Typically, these motors propel much heavier boats, which is why the propeller’s diameter and pitch which determine output in terms of speed and torque are of no real consequence to the owner of a Wavewalk under normal conditions. All the brands listed above are known to produce quality motors, and in fact some of them produce motors for others. For example, Mercury is a Tohatsu brand. This is to say that we see no reason to pay more for a particular name brand, and we recommend to consider only the motor’s technical attributes, and its price. HP rating – can i overpower my skiff? 6 HP is the absolute maximum for which the W700 is rated, and this is only for its RIB model. Overpowering your Wavewalk can be hazardous, and if you use the wrong motor mount you’d be calling for trouble. This said, if you happen to own a 20″ shaft 5 HP motor and your W700 is rated for a 4.5 HP motor, you can keep your motor, and you won’t necessarily have to get a new one. Similarly, if your W700 is rated for up to 4.5 HP and you found a nice 4 HP that you like, you’d be fine with it. If you choose to make a DIY mount for an electric trolling motor, chances are that you’ll succeed, since these motors are so weak that they’re not likely to cause trouble. But this is not the case with the gas outboard motors in the range that features on the above list. There are several issues to overcome with motor mounts, and the motor’s weight is the least of them. The main problem is that operating at the end of a 20″ lever, the motor’s propeller generates a great amount of torque, especially at high speed, in rough water and when making sharp turns at high speed. This torque can twist and crack a 4×2 timber, and pull out nails and screws from their place. After having seen motor mounts get broken by outboard motors ranging from 6 to 3.5 HP that were mounted on them, we strongly recommend not to build a DIY motor mount for these motors, and to use only the motor mounts that Wavewalk recommends. Some of the more powerful outboard motors listed here can be outfitted with an alternator and an AC to DC converter. Note that such accessories cost hundreds of dollars. The electric current produced by this system can be used to power lights on board, or to charge a trolling motor’s battery. Such setups are common in bigger boats (e.g. bass boats) that feature much more powerful motors. Although some Wavewalk owners have outfitted their W700 with two motors (a powerful one for driving and a small one for trolling), we don’t know of anyone who’s outfitted their outboard motor with an electric current generation system. Skiffs, Jon boats and other small boats sometime come with other motors, among which are air drives or air motors (large diameter propellers) for running marshes and flats, jet drives (similar to personal watercraft, a.k.a. jet-ski), long shaft mud motors for going in shallow water and over obstacles, and outboard motors that run on propane. While each of these motors offers certain special advantages, and we’d love to see the W700 outfitted with any of them, as well as with other propulsion systems ranging from sails to oars, and even pedal drives… we think the common small outboards such as we listed here offer the optimal mix of price, performance, reliability, versatility, ease of use, and ease of maintenance – Just think how common are boat dealerships and repair shops that service these motors… And if you know how to use your outboard motor and you take care of it, it’s truly a wonderful thing that you’d enjoy for years, and possibly even decades. Please do not discount the potential of electric trolling motors as a real source of propulsion and low maintenance joy. Many kayaks cannot be launched easily without a special (and expensive) custom ramp. Wavewalk owners can launch our crafts from almost anywhere (including icy river banks). Thus, we can get so much closer to the best fishing holes by driving our vehicle or mother ship nearby and then slip the W500 or W700 into the water. Most successful fishermen either move slowly from one spot to another casting to choice habitat, quietly troll, or motor to a prime hole and anchor. Under these conditions, an electric trolling motor and battery or two will last all day. Power consumption can be measured in cents not dollars. 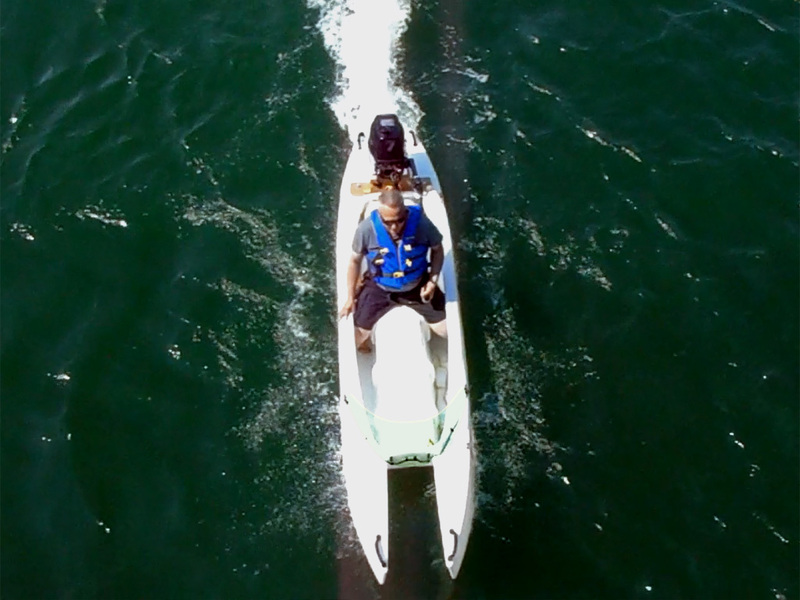 The completely unique motorizing characteristic of the W700 is the ability of this kayak/skiff to safely and easily accommodate a gasoline powered outboard at the stern and an electric trolling motor in the bow. How many kayaks can do that? Instead of paying ninety thousand dollars for a new bass boat and trailer, a W700 owner can invest less than four grand and catch more fish in a go anywhere vessel with multiple power options. If all else fails, we can paddle home. Try that with a bass boat. Though I have paddled a 25′ diesel boat to safety with a T-shirt tied over the hoop of a crab net. Each Wavewalk owner has his or her own special needs when it comes to motorizing but, in particular, the W700 is most adaptable to nearly any reasonable combination. DIY guys can have a blast custom outfitting. However, the heavy duty transom bracket you provide will insure that an expensive motor does not venture away from the vessel. And, I have to put in a plug for the Tohatsu based motors for dependability and parts access. There is a reason Tohatsu outboards are used by commercial fishermen in oceans all over this world. And, there is a reason why Mercury, Nissan, and Mariner rebrand rather than make their own small outboard motors. Remember to always use non-ethanol gasoline. We have clients who use powerful electric motors as a “real” (namely high speed and/or adverse conditions and long distance) source of propulsion on big bodies of water, e.g. Pyt Rotary, from Ontario, who fishes the great lakes and the ocean, and we have many clients who are interested in electric propulsion – Most of them for trolling and short trips on flat water, and some for “real” propulsion. What I’ve been trying to do here is to shed some light on a ‘hot’ field that many clients are interested in, and establish some useful criteria that could help them take better decisions, now that Wavewalk offers the W700 as a portable skiff that’s suitable for high performance motorizing. A few years ago, I worked with our local high school students to build an electric 1/4 mile drag racer. A Google search of [Green Hornet MR2] should show the car. We held NEDRA records for a few years till the students moved to other ambitions. The W700 properly rigged with new electric technology has the potential to take top awards in the maritime EV competitions. Presently, I am looking at the 2017 Wye Island Electric Boat Challenge. This is a 24 mile run around Wye Island on the Eastern Shore of the Chesapeake Bay. The schedule coincides with a time when I should be in Maryland to do business and enjoy the fishing opportunities, there. About 15 grand in lithium batteries and electric propulsion will get me where a Tohatsu outboard will already take you. I’m one of those people who suffer badly from noise – any kind of noise, and in all circumstances, so I welcome electric motorizing for being quiet. I also don’t like gasoline fumes (who does? ), but as we all seem to agree, including big fans and heavy users of electric Wavewalks such as Pyt, electric propulsion for small boats such as the W is still not the panacea, and it offers a clear advantage over gas powered outboard only in certain conditions. Yes, the solar panel did daily charge the single 12 volt battery that operated the contactors, turn signals, headlights, and other 12 volt accessories. However, the dual 108 volt banks were charged from the grid for daily driving. At the track, we jumped the two banks into one for short runs at 216 volt. Over the years, we upped the voltage to 288 volts and blew up the DC motor in a shower of sparks. For the time being, there will be a 3.5 Tohatsu outboard at the stern and a 12 volt Minnkota trolling motor in the bow of my W700. High voltage and salt water do not mix. Remember that song by Deep Purple? Any ideas on speeds for the 700 with various horsepower outboards? In principle, a 6 HP outboard could get this boat going at close to 20 mph, but I won’t even try to approach such speeds, and I won’t recommend it to anyone either.